Another way to enjoy the superfood kale nutrients, is to make a delicious kale salad. There is a simple trick to eating kale raw that turns it from tough to tender and appetizing. The trick to tenderize the tough leaves is to first cut off the tough stems and the veins of the kale. (I save the veins to use in a juice and or put a few in my smoothies. I also will chop the veins up into small bitesize pieces and put them in the freezer for a soup vegetable.) Take the leaves and roll them into a bunch and chop, chop until you have small pieces. Chop the kale into thin ribbons as described above. Drizzle with the vinegar and olive oil and then sprinkle with salt. Thoroughly massage the leaves with your hands for several minutes. Add the apple, mushrooms, almonds, onion and honey. Marinate for about 10 minutes. Serve. 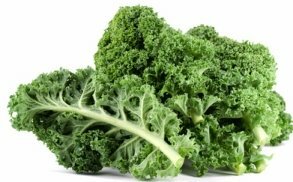 Kale is loaded with vitamins A, K, and C. It has minerals, fiber, phytonutrients, and omega-3's. It is now being called the new "beef". Adding it to your diet through salads, smoothies, or other raw recipes is adding a great source of awesome nutrition! Try Kale Chips as another way to use this great green leaf.